Rain was forecast for today, so we did the route that I made up that travels around the city, never going more than 2 miles from the nearest Metro Rail station. That way, if the sky opens up and rains on us, we have a quick exit strategy at all times. The route starts out going downtown, and then south along the Blue/Expo lines to near USC. From there, we head west, riding about mid-way between the Expo Line on the south, and the Red/Purple subway line to the north. 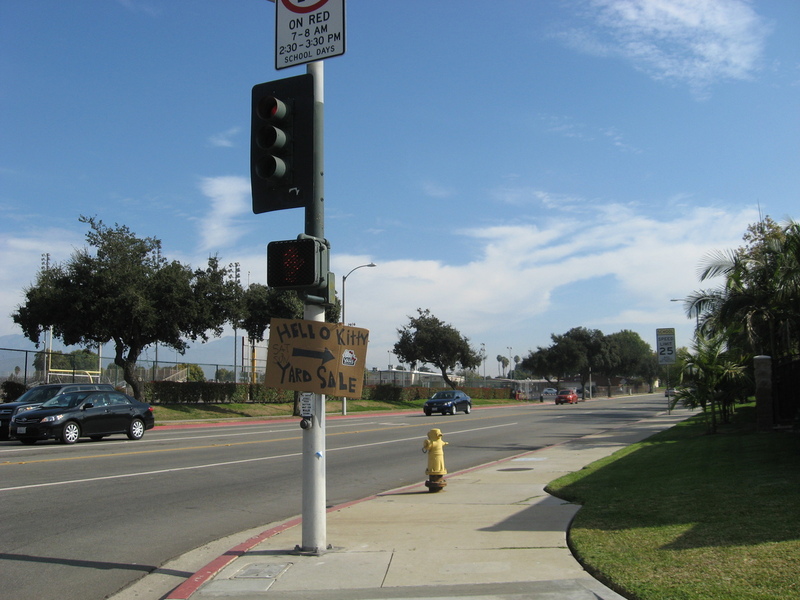 At that point, we were passing the Angelus Rosedale cemetery on Washington Blvd. 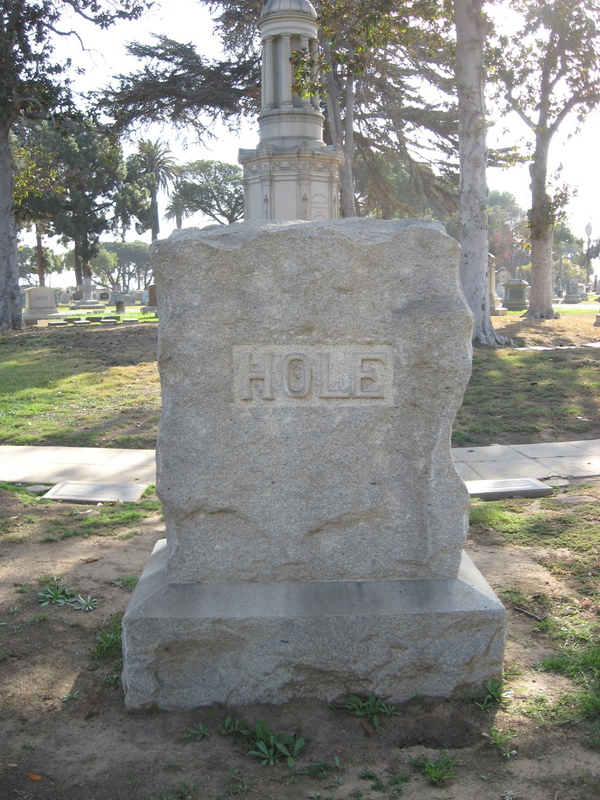 We’d been there before to visit the grave of Dooley Wilson, who is known for playing Sam in “Casablanca”. 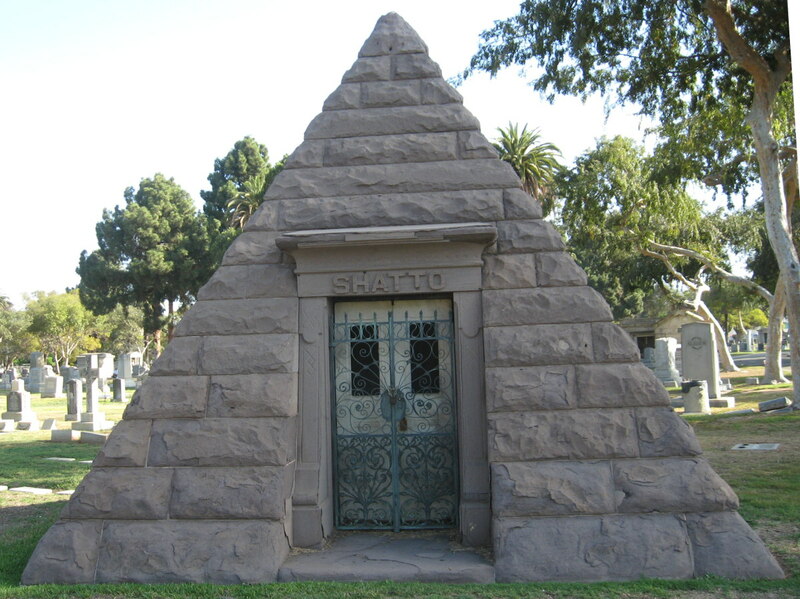 We stopped in there because last April, when we were riding in the Ciclavia to the Sea, we rode by the back side of that cemetery, and I saw a large pyramid there. 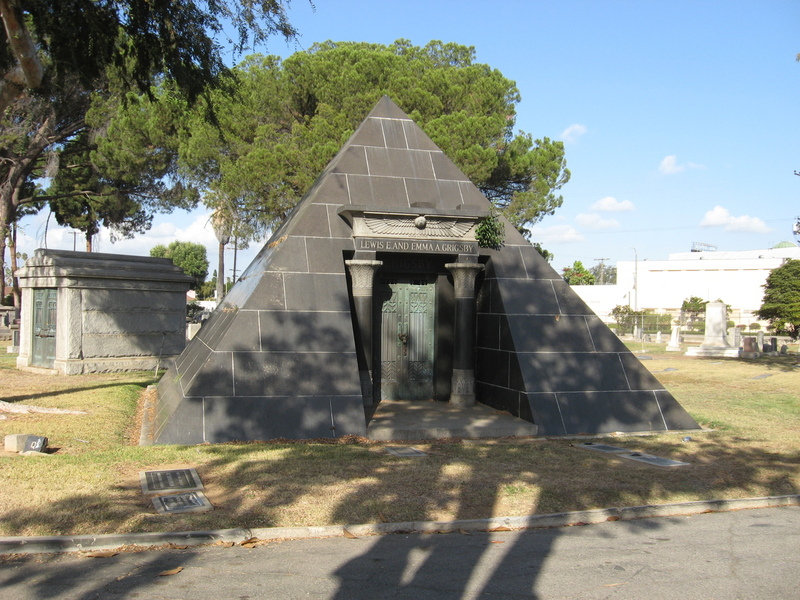 I’d done some looking, and apparently there are three known pyramid crypts in Los Angeles County. 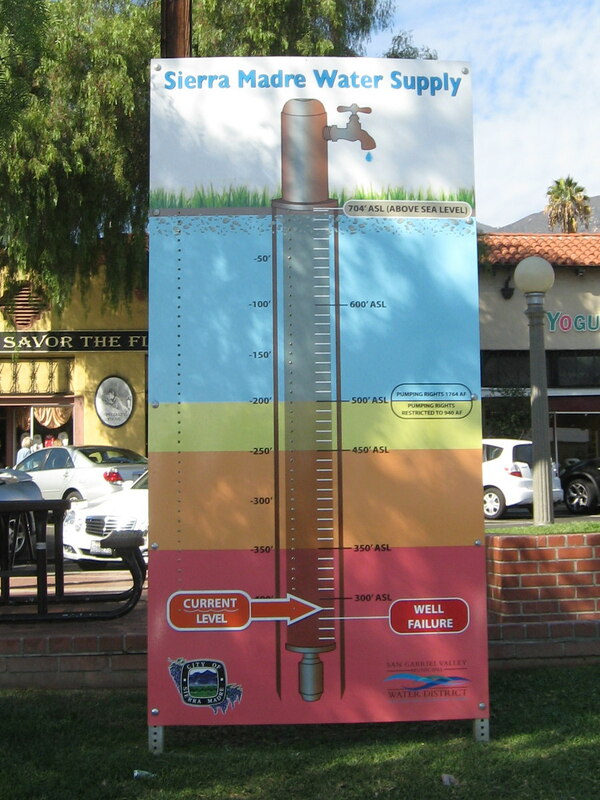 One is in Brand Park in Glendale, and is not accessible to the public. The other two are in Angeleus Rosedale. So we stopped off to see the two pyramids. After that, we headed up through the Harvard Heights neighborhood to Larchmont Village and Noah’s Bagels. We had some snacks, and then headed for home. By now, the weather was looking quite fine, with no threat of rain. 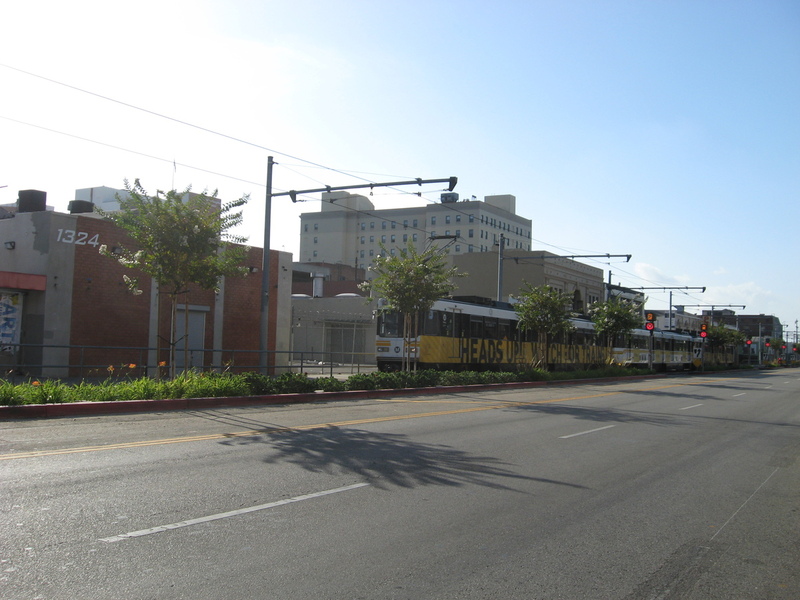 But we stuck to the route, heading back on 7th St, roughly parallel to the subway line under Wilshire, and then through Chinatown and home by way of Lincoln Heights and South Pasadena, along the Metro Gold Line route. All told, it was a pleasant day, and we were glad not to have to use our exit strategy. Today was the last race of the year here in Los Angeles. 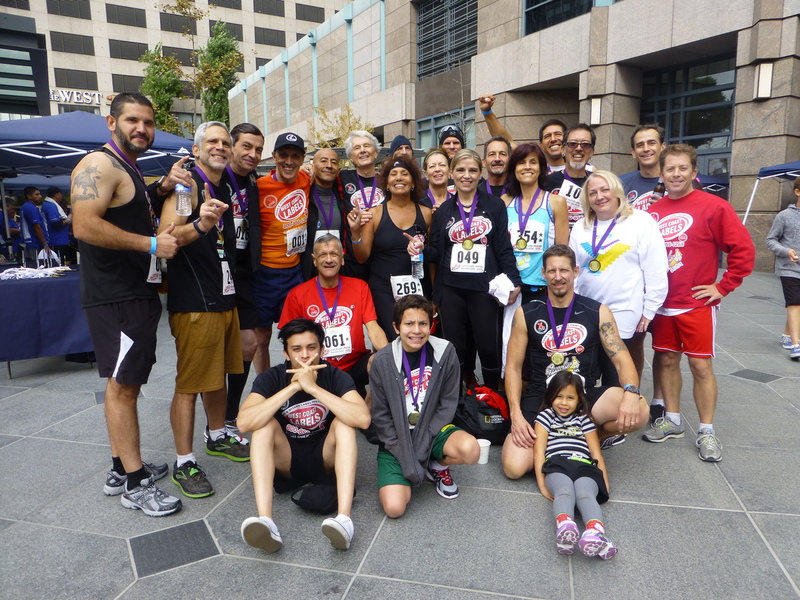 The Cystic Fibrosis Foundation’s climb up the Wilshire-Figueroa building in downtown L.A. This year was the first time that we were going to race all the way to the roof, making the total climb 1,245 steps, or the equivalent of 54.1 ‘regular’ floors in this building. 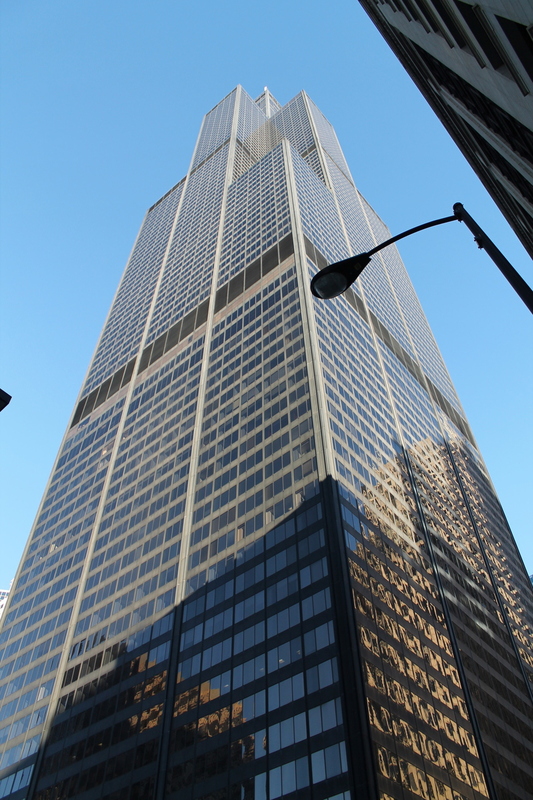 We’ve been climbing this building since July, since it was the site for our practice climbs before the YMCA’s climb up the U.S. Bank Tower. 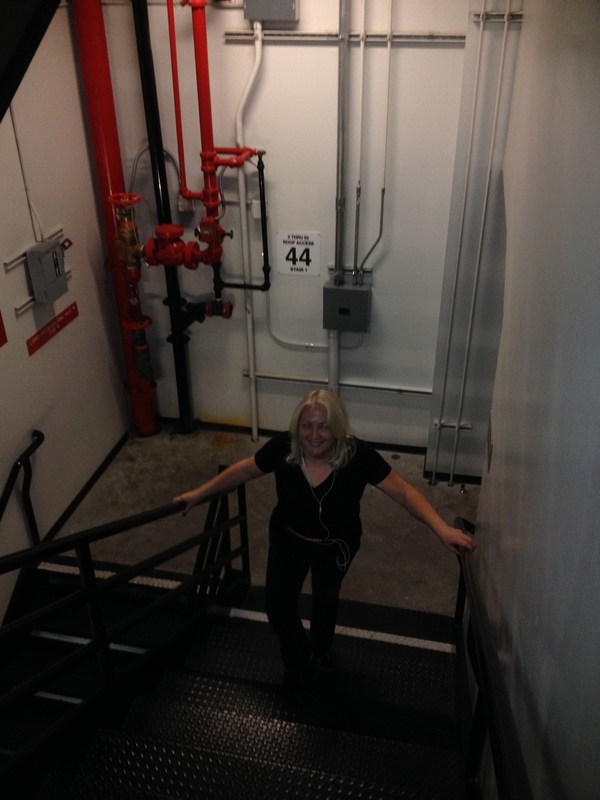 And just last Monday, I reached my 100th climb up the staircase. 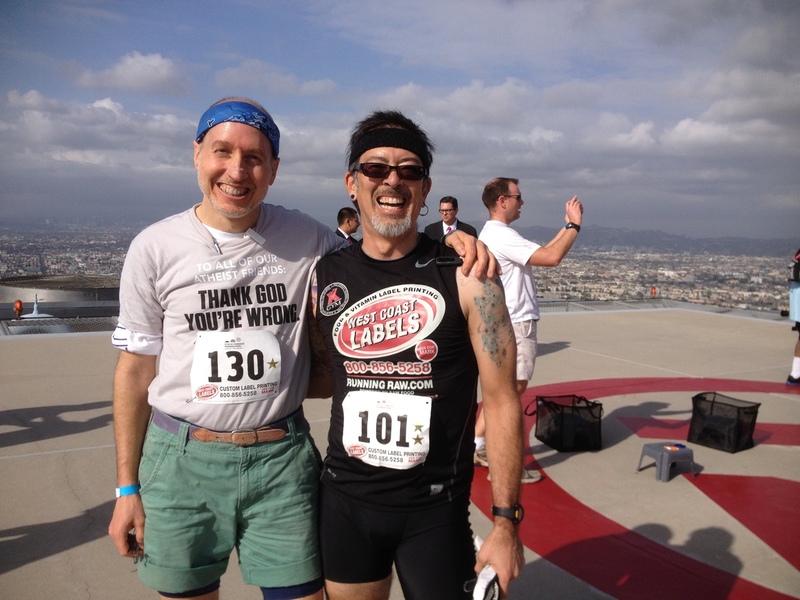 In honor of this occasion, I emailed Rebecca, the event organizer, and I asked if I could get bib number 101 for today, since the race would be my 101st climb up the building for the year. She wrote back that she had planned on assigning the first 20 numbers in the order we’d finished last year, and I’d been 7th overall last year, so I was slated to be ‘007′. Hmmm. That was a tough one. But in the end, I told her that I thought ‘101′ was still funnier and more appropriate for the day, so she agreed to give it to me. In the morning, we headed downtown to the building. Kathleen was going to do the climb, too, so we got checked in and ready to go. Being in the ‘fast’ group, I went up near the front of the line. We all know each other up there, and we sorted ourselves out by how fast we expected to be. 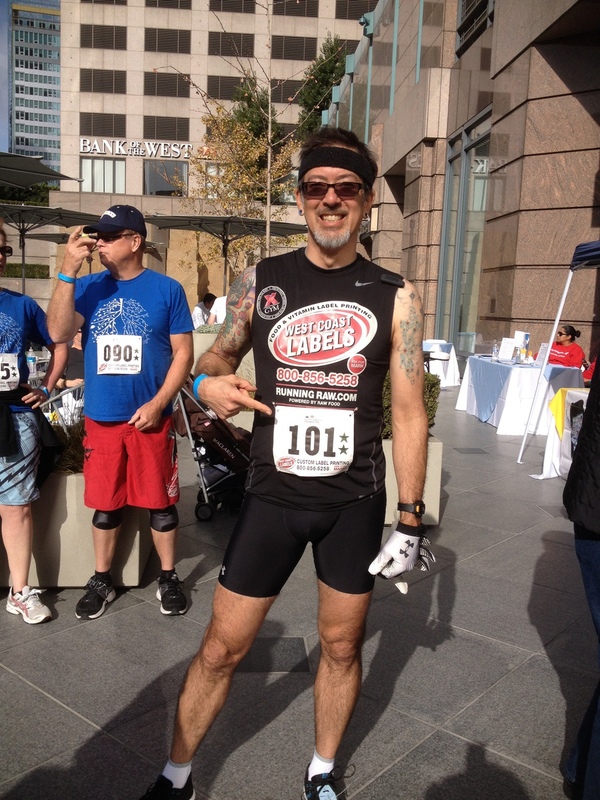 Besides my 101st climb, my only other goal for the day was to beat George. So I started a few places ahead of him. I was maybe the 8th or so person off the line, and that worked out well. I didn’t pass anyone, and nobody passed me. I was even able to maintain focus the whole way up. I did have one small wave of ‘what-the-HELL-are-you-trying-to-prove-here’ at about the 35th floor, but I was able to press on through it by just concentrating on my goal of beating George. I knew that he was coming up the staircase behind me, so I knew that I had to stay ahead of him. 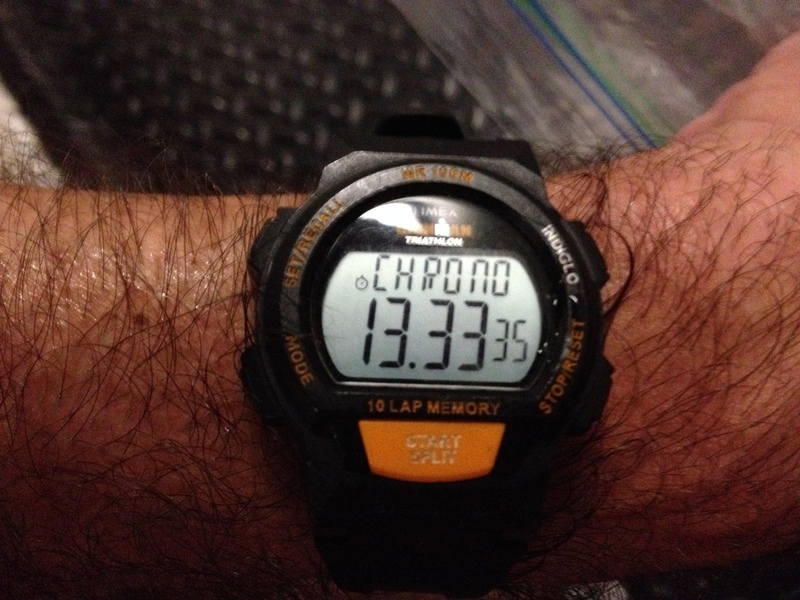 I was aiming for a pace of 6 floors per minute, and I was able to keep to that up to about 30. 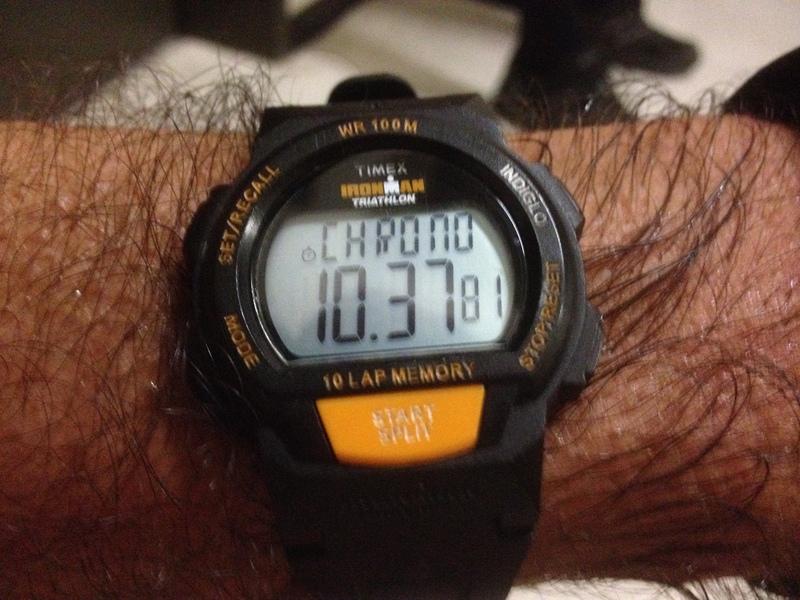 After that, I came up about 3 steps short on each 1-minute block. Still, I went faster than I’d gone all year in practice, so that was a good thing. I tried to sprint up the last two floors, and when I saw the light from the roof door, I was able to sort of run up the last bit to the roof. I don’t think I need to describe just how painful that was. 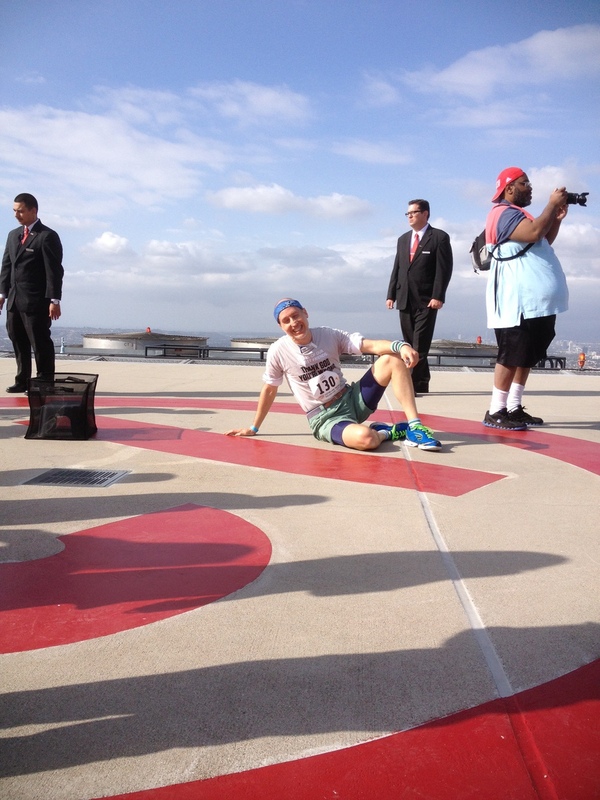 But I made it to the roof, and my reward: collapsing on the concrete helipad there. I spent a minute or so lying down, and when I looked up, I saw George lying on the concrete a few feet away. After we’d both caught our breath, we took a picture together on the roof before heading back down. 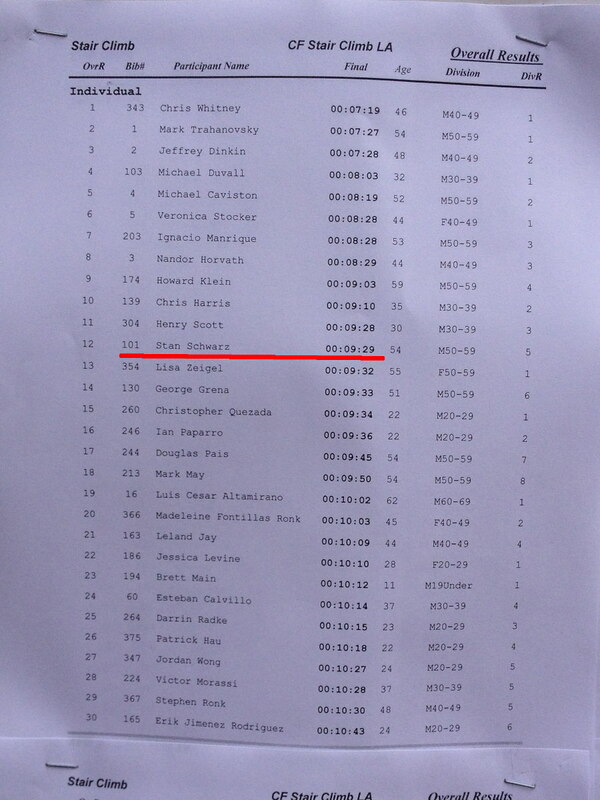 When they posted the results, I saw that I’d done 9:29. This was reasonably good. I could have possibly gone faster, but it was still faster than I’d gone in any of the practices or other races this year. And more importantly, I beat George by 4 seconds. Not much, but enough. 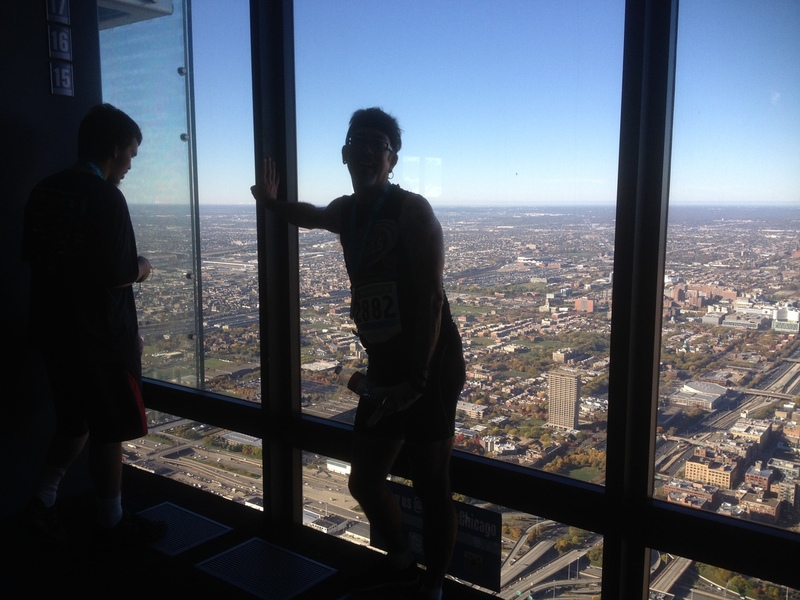 I ended up being 12th overall, which I can’t complain about, since there were something like 200+ people doing the climb. 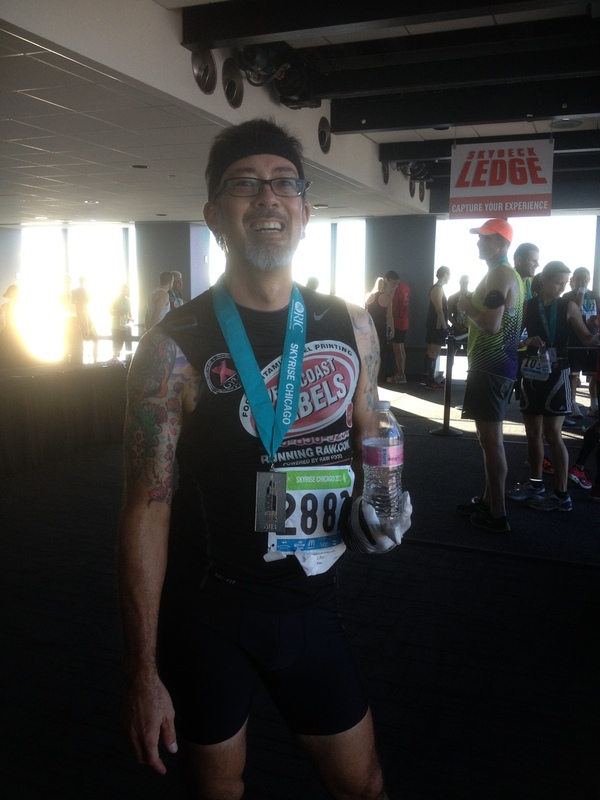 So overall, I was satisfied, even if I didn’t make the top three in my age group this time. 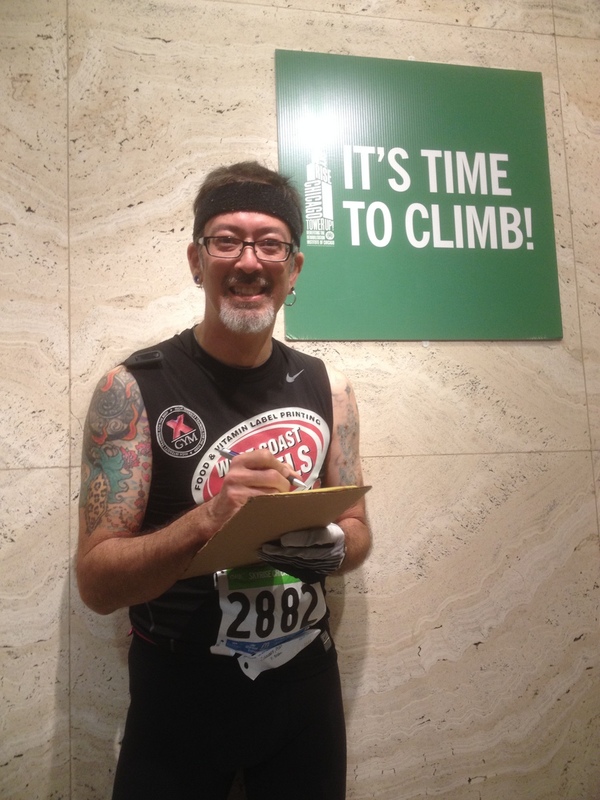 Now I get about six weeks off from stair climbing before practice starts up again in January for the Lung Association’s climb up the Aon building. Fun times. 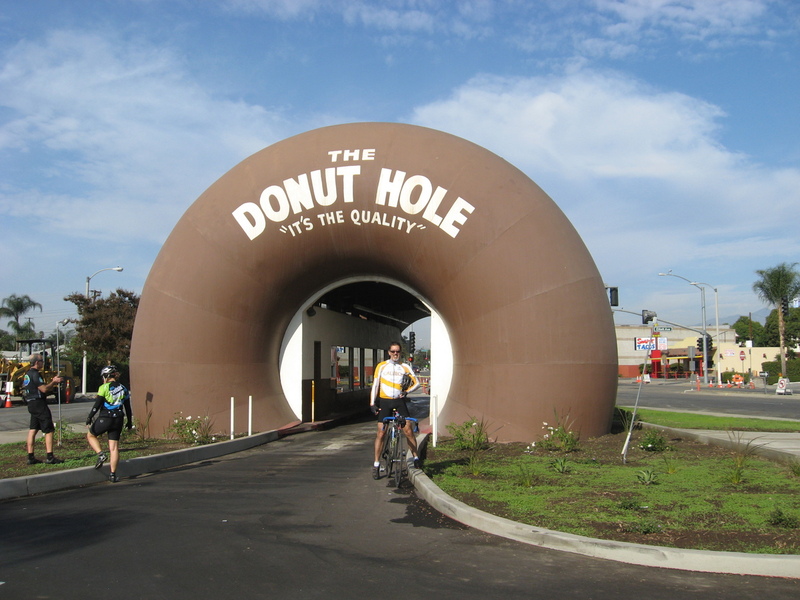 Today’s bike club ride was the route to La Puente to see the giant drive-through donut. We’ve been there before, but it’s been a while. It was a pretty nice day for riding. Cool, but promising to warm up a bit. And no forecast of rain. So we headed out, south and east. 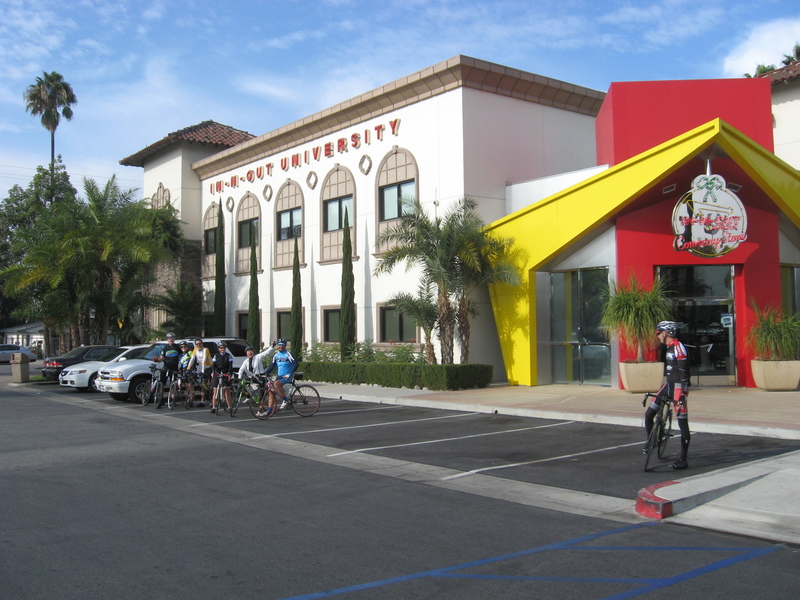 We stopped for a photo opportunity at the In-n-Out Burger headquarters and In-n-Out University. Then we continued on to the Donut Hole. We stopped for pictures, and Carla even rode through to get a donut. After that, we continued on, out to West Covina, and then back north to Monrovia and our snack stop at Merengue. It was a pleasant and pretty uneventful ride. When we got back from Chicago on Monday, we got word that the Monday night stair practice had been cancelled, but that an extra one had been added for next Monday, the 11th. Between tonight and Monday, I should have no problem getting my 100 climbs in. 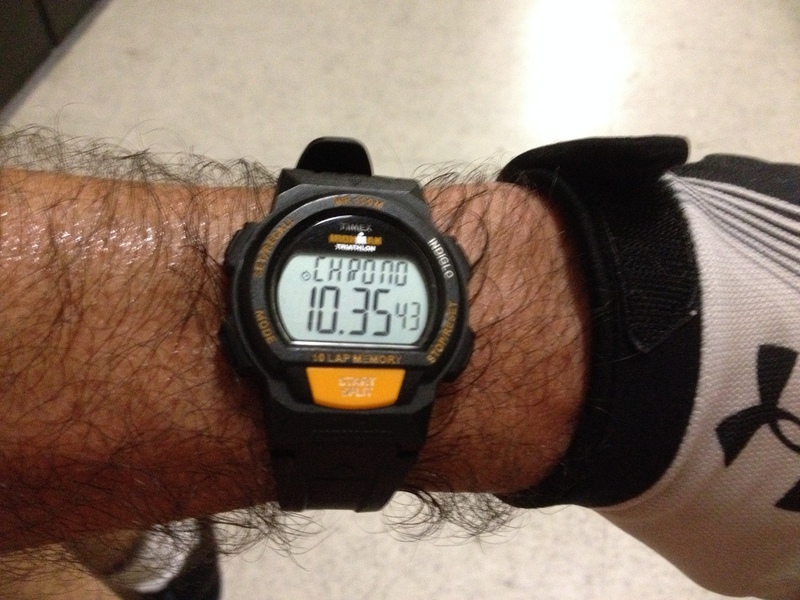 Tonight, my goal was to start off doing the 4 3/4 floors per minute pace, and to maintain that as long as I could. 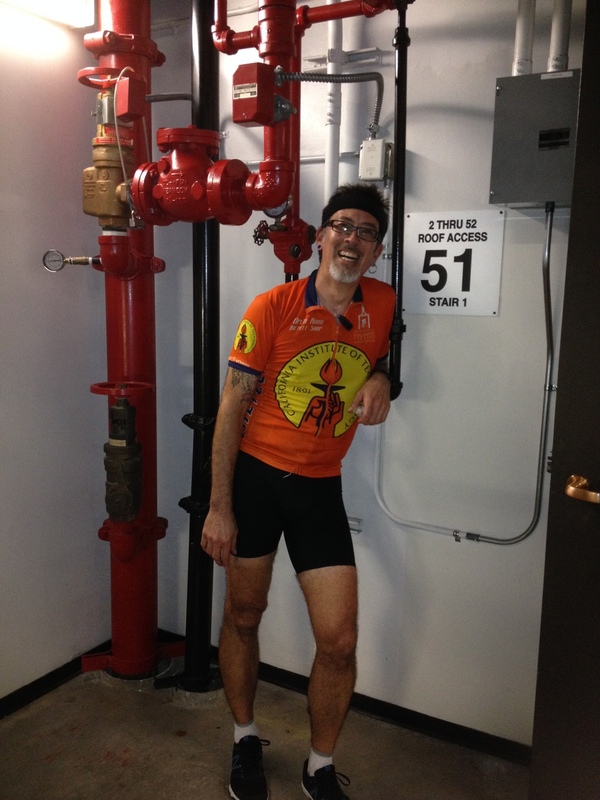 I was able to do it for the first two climbs, but on the third, I had to scale it back to 4 1/2 per minute. 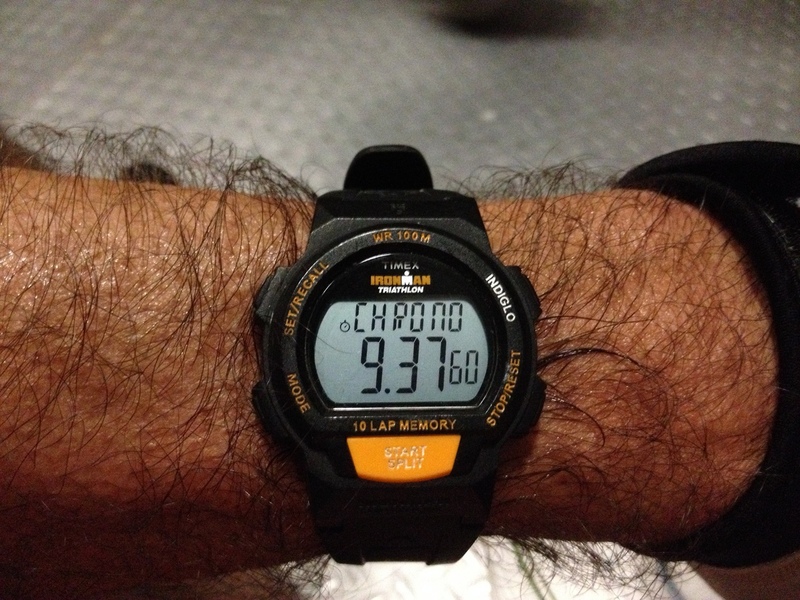 On the 4th time up, I slowed down to 4 1/4 per minute, and on the last one, I just wanted to get to the top before the end of practice at 7:00. So with these five climbs in, I now have climbed this building 97 times. If I do two next Monday, then on race day I can do the 100th climb. Kathleen got me a Fitbit One for my birthday last week, and I brought it along for tonight’s fun and frolic on the stairs. I was curious how it works out how many floors it thinks I’ve climbed, so I looked it up on their web site. 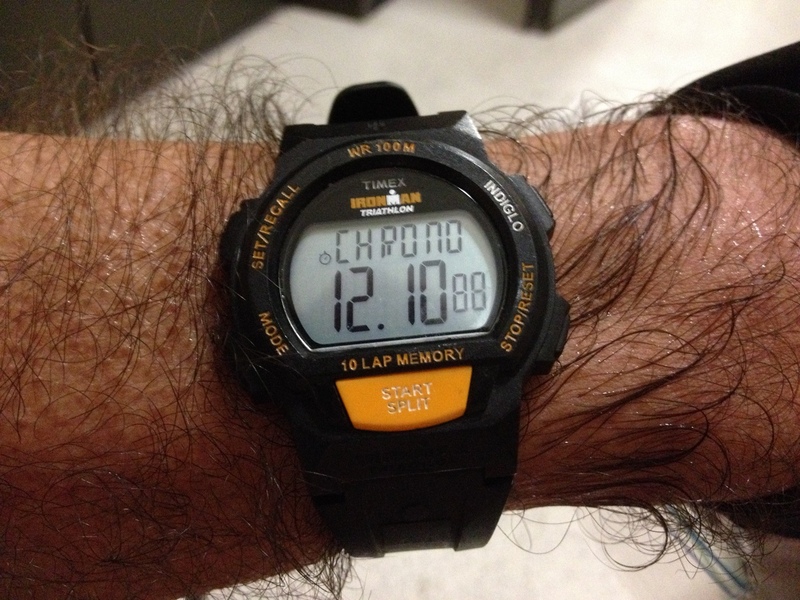 It says that the device has an altimeter built in to it, and it counts every 10 feet of elevation gain as one floor. So by that measure, climbing this building should count for about 64-67 floors, depending on how accurate the air pressure sensor is. 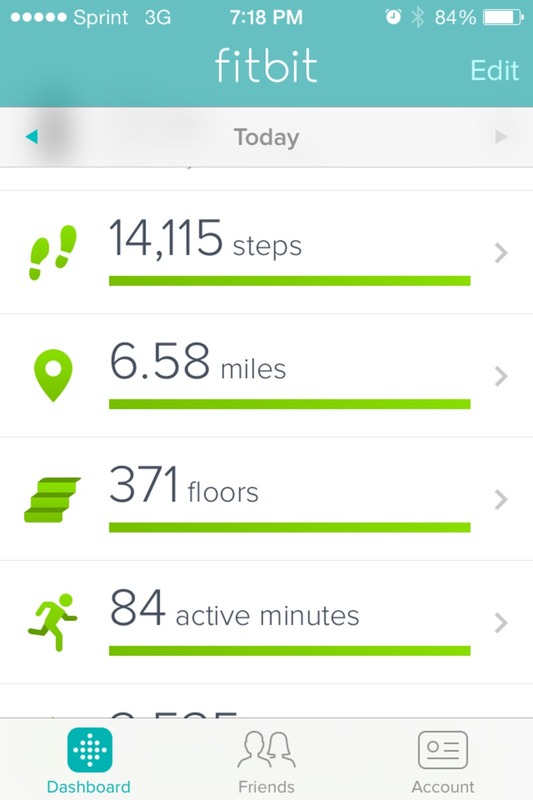 In any event, Fitbit says I’m an overachiever today. Since we missed playing tourist in Chicago on Saturday, Monday was the day. 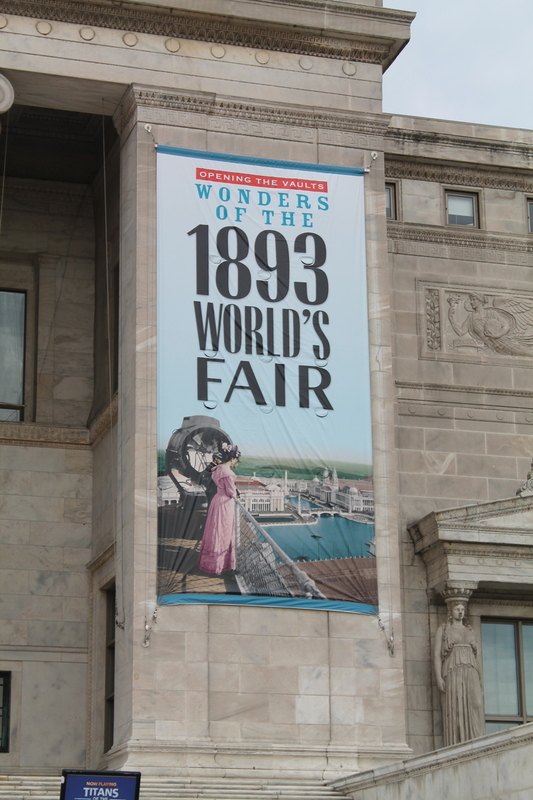 We went to the Field Museum to see the exhibit about the 1893 World’s Fair. Since I’d been reading about that last year when we were here, it all fit together nicely. 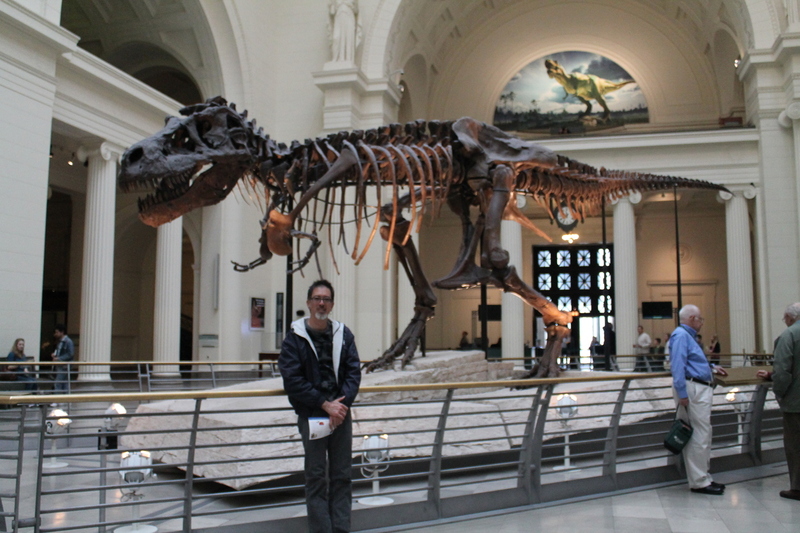 We saw Sue the T-Rex in the main hall of the museum. 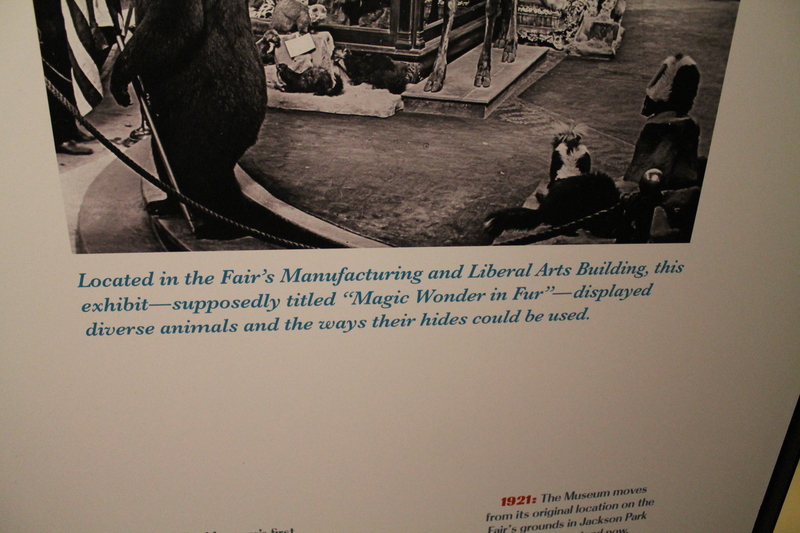 Then we went to see the World’s Fair exhibit. It was interesting to see how the attitude of the fair seemed quite foreign to us. 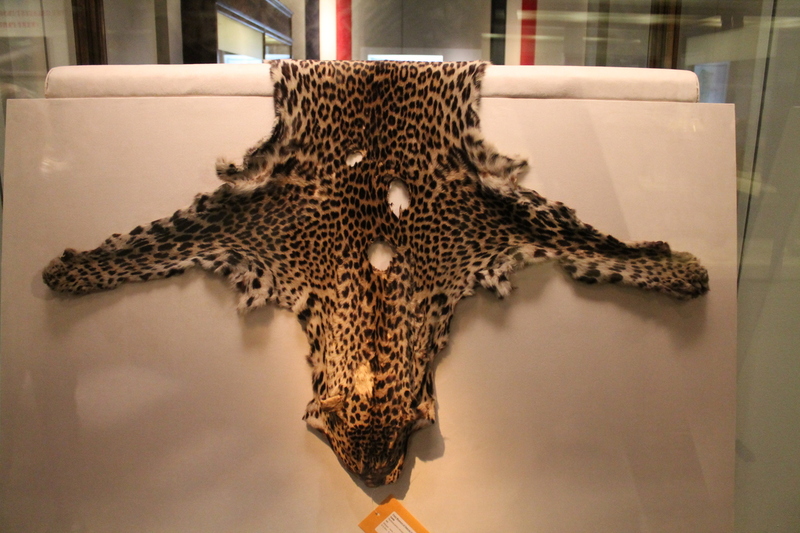 It seems that back then, nature, animals, and the world itself were all regarded as things to be used, rather than things to be studied or understood just for themselves. After that, Kathleen wanted to go see the Hall of Gems. 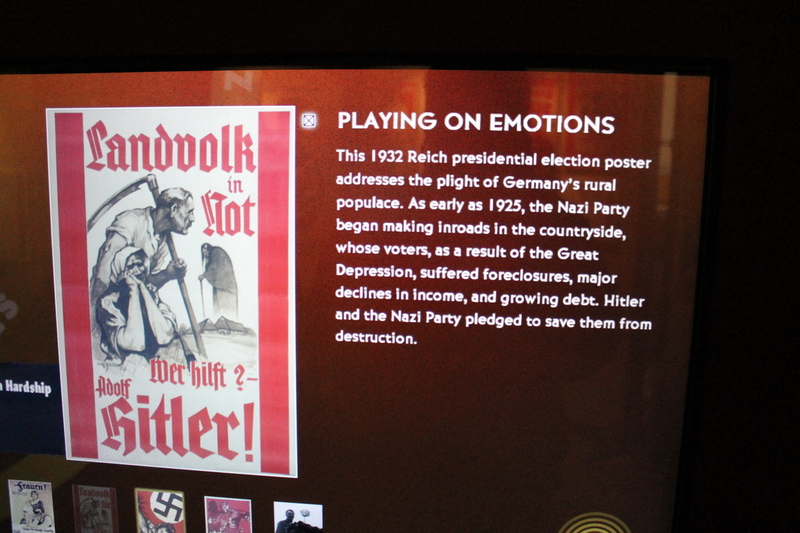 And along the way there, we stopped in to see an exhibit about fracking for oil in the Bakken Shale in North Dakota, followed by an exhibit of Nazi Propaganda. 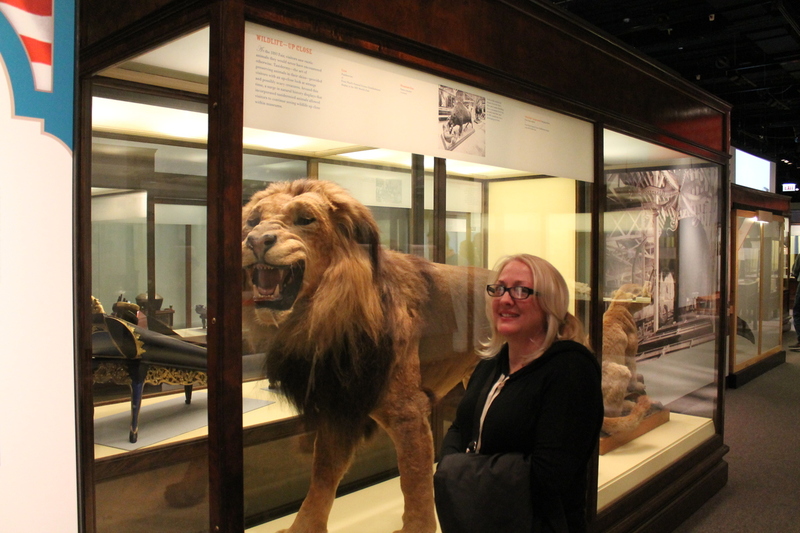 It was interesting, although it was a bit far afield from ‘Natural History’. 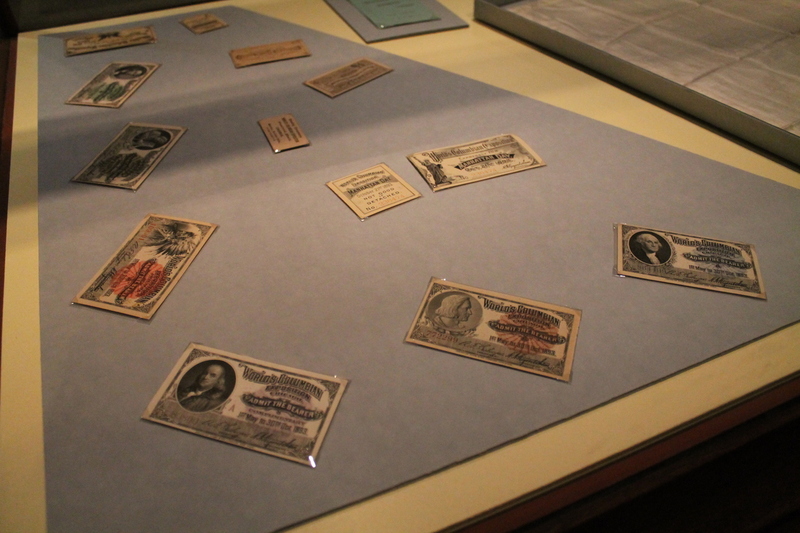 But it did make a nice companion piece to the exhibit we went to see a few years ago about Nazi medicine. And parts of it were uncomfortably close to things we’re hearing and reading about today. After all that, we went to the airport for the trip home. Despite the unpleasant beginning, this turned out to be a pretty good, if short, trip. Sunday morning came much too early. I was supposed to be downtown for a 7:30AM start up the building. 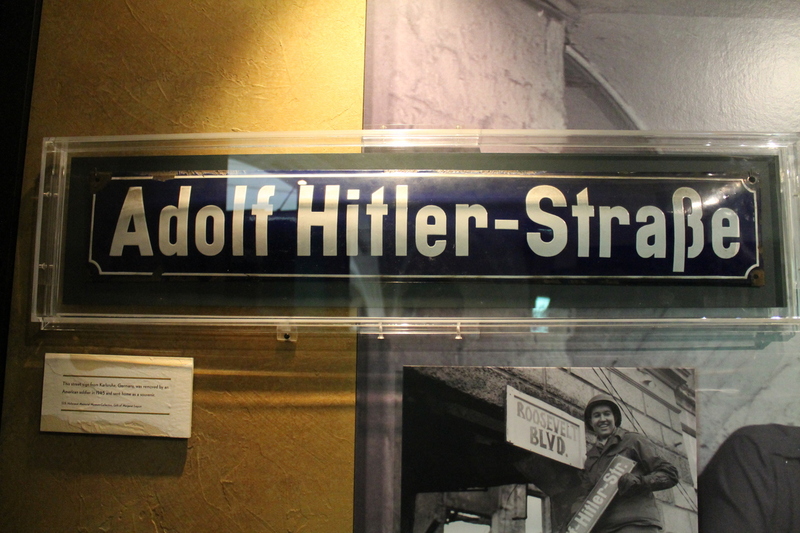 We got up and headed over to the train station. 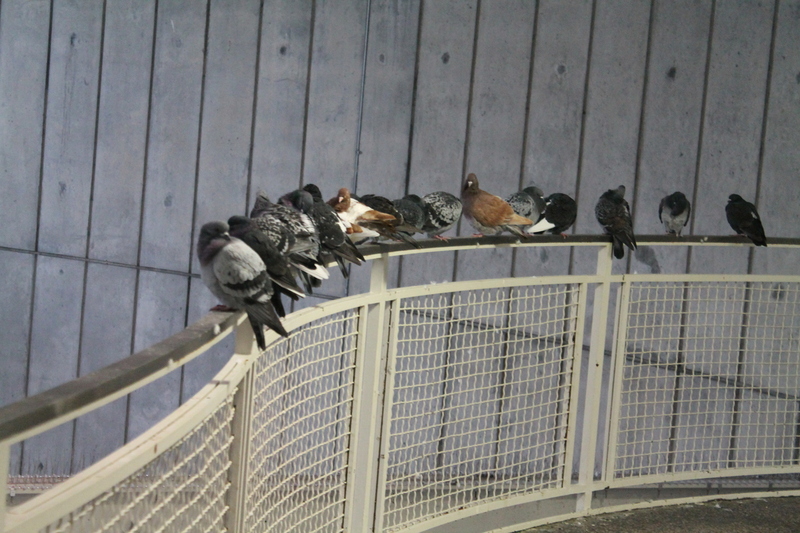 There were puffed-up pigeons roosting in there, just trying to stay out of the cold wind. 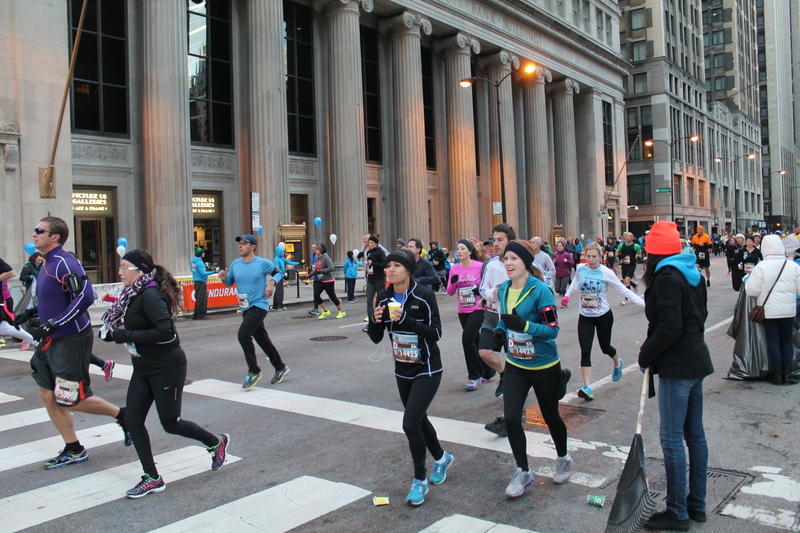 And on the train downtown, I noticed that there were many, many people on there way there for the Hot Chocolate 5k run. I couldn’t help but notice that they were all smiling and laughing like they were going to have a grand time, while I felt a bit like a lamb being led to slaughter. Once we got downtown, we walked over to the building. 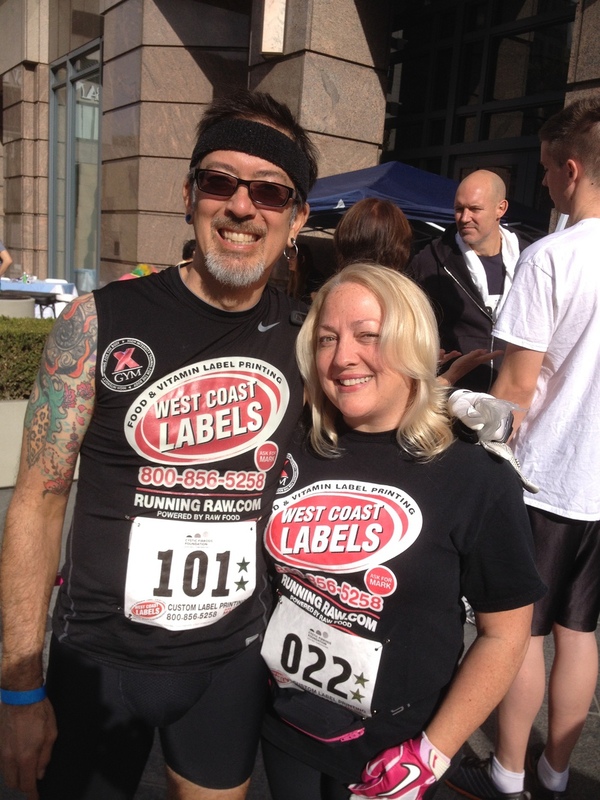 Because we’d gotten in late, I had not been able to get my packet yesterday, so I found out I had to go talk to the people and get a new number assigned so I could run. By the time all that was done, it was almost 8:30 when I got in line. I started out at the same time as Michael from the WCL team, so we stood for a green-screen picture at the bottom. Then it was time to go. As has been the case all year, I just couldn’t face trying to go fast, so I just went up at a modest pace. 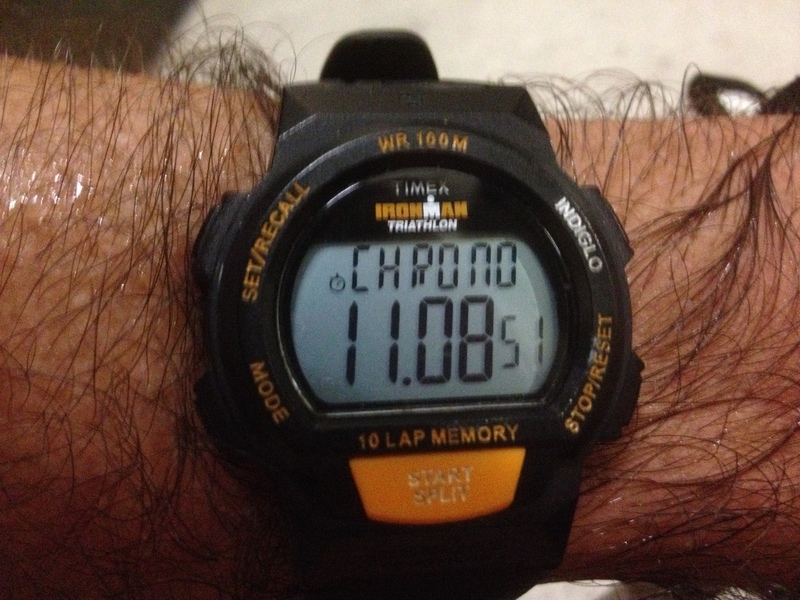 4 1/2 floors per minute. It’s fast enough that I pass about 90% or the people there, but not so fast that it’s seriously painful. 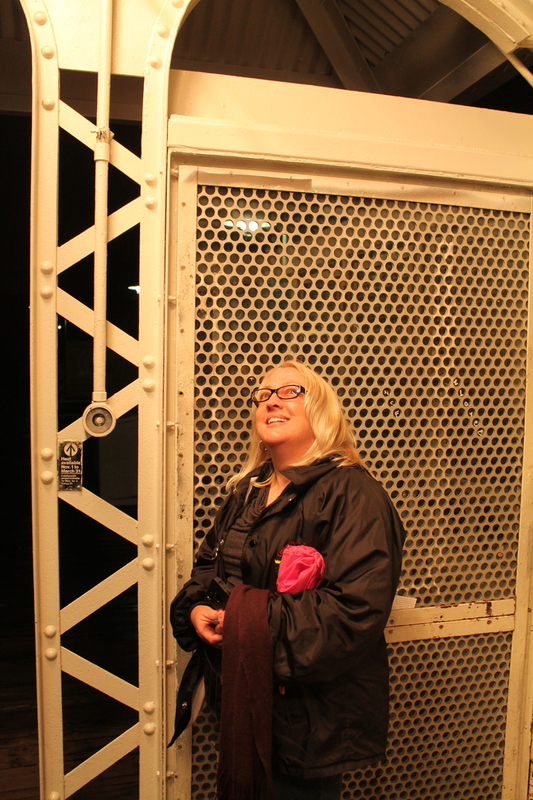 Still, I got stuck in traffic in the stairwell. There were people with prosthetic legs and crutches climbing the building. While I admire their courage, do they really need an entire entourage around them, blocking the whole stairway for everyone else? Anyway, I made it up in reasonable style. Felt pretty good at the top. No collapsing like a sack of potatoes this time. I spent a little time looking at the view and socializing, and then I headed back down. At the bottom, I rounded up some paper, a pen, a piece of cardboard and Jane and Steve to climb with me. The three of us got back in line and went up a second time. I took notes along the way so that I can fix up the chart that I made last year from PJ’s GoPro video. After the second climb, I headed back down and we went back to the hotel to get cleaned up and ready to go to Kathleen’s aunt and uncle’s house. 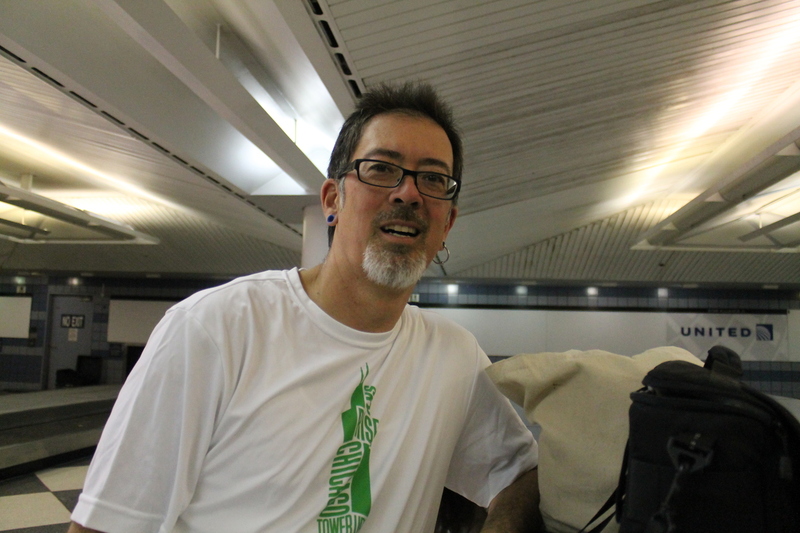 On Saturday morning, we headed down to LAX again in hopes of actually getting to Chicago today. 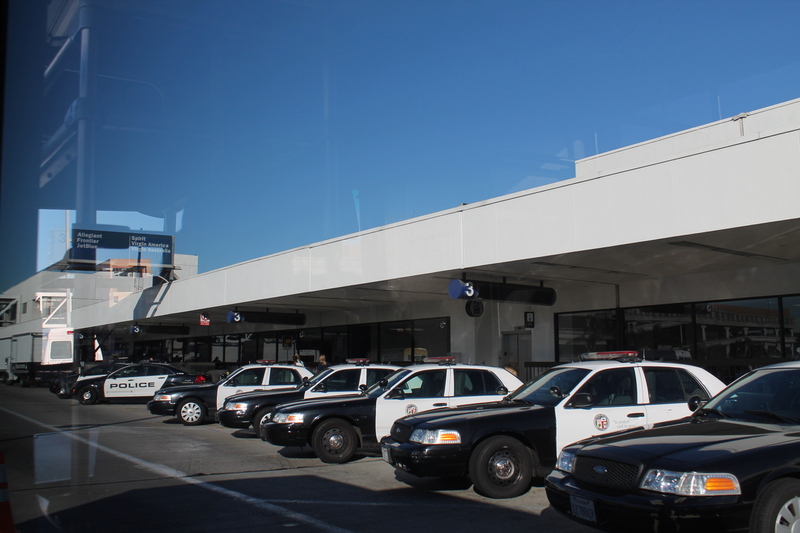 And despite the chaos yesterday, it seemed normal today, aside from the fact that Terminal 3 was still closed, and there was a solid like of police cars parked in front of it. Everything else was normal, and we got out on time. 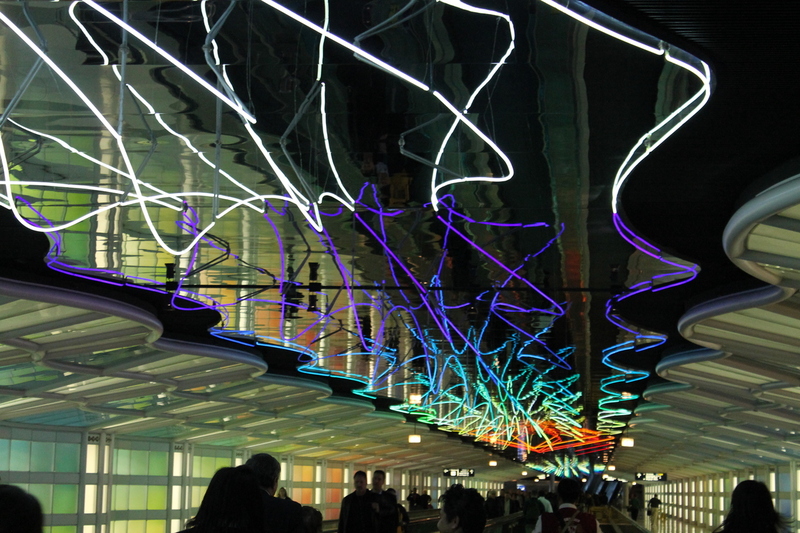 Arriving in Chicago, we got our bags and took the train to our hotel. 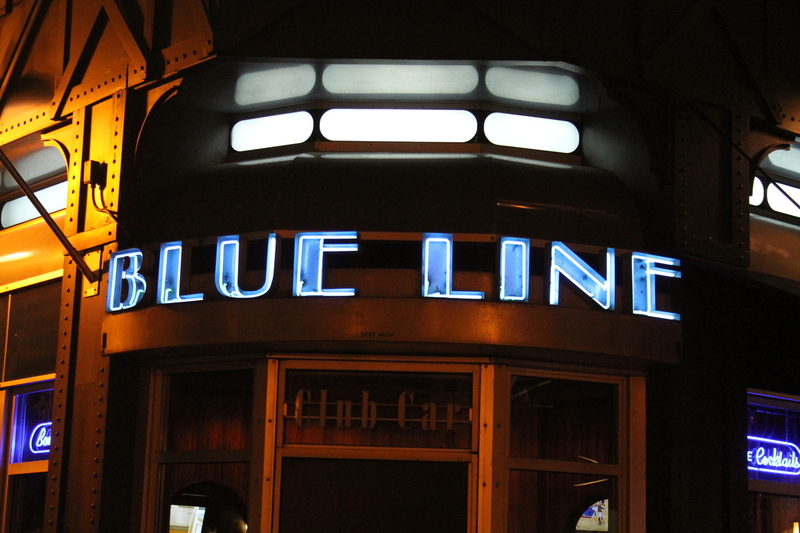 Then we rode the train into the city to have dinner at the Blue Line Lounge. That was supposed to be our activity for Friday night, but that didn’t work out. 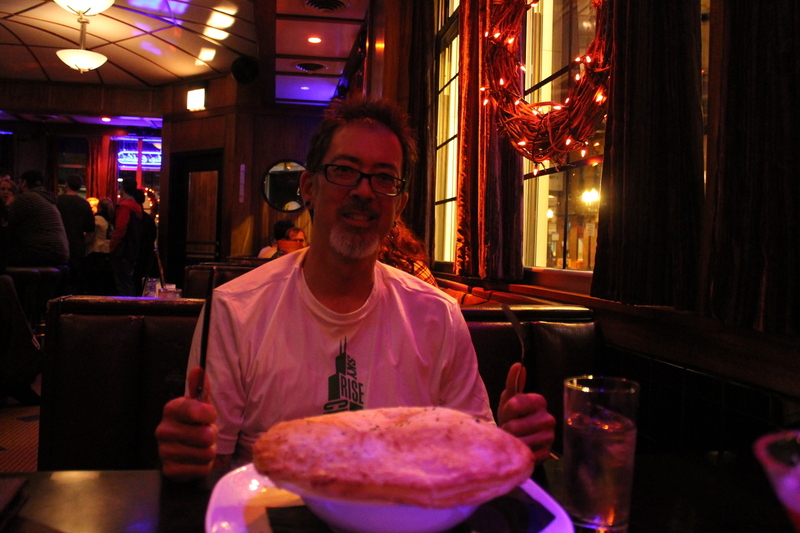 Still, I got to have the tarragon chicken pot pie. 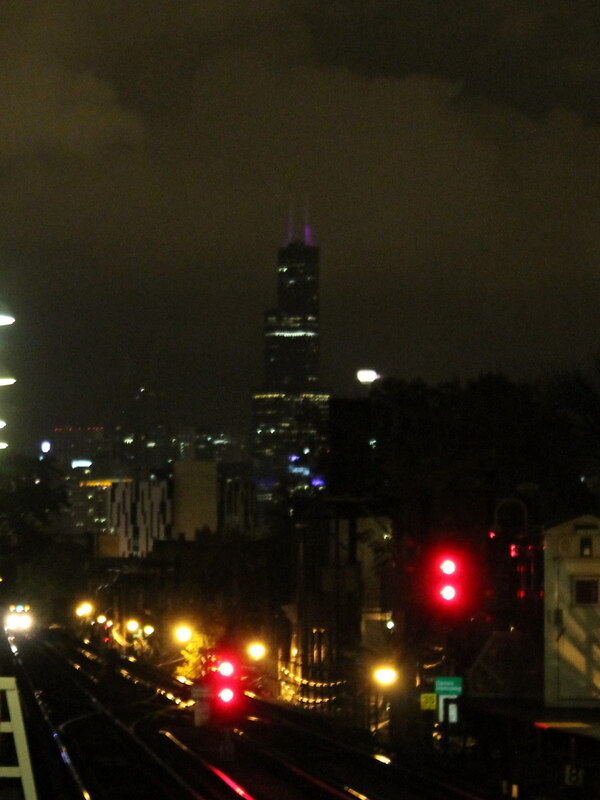 And after that, we headed back to go to bed, although I did take a minute to look at the Sears Willis Tower from the train platform. 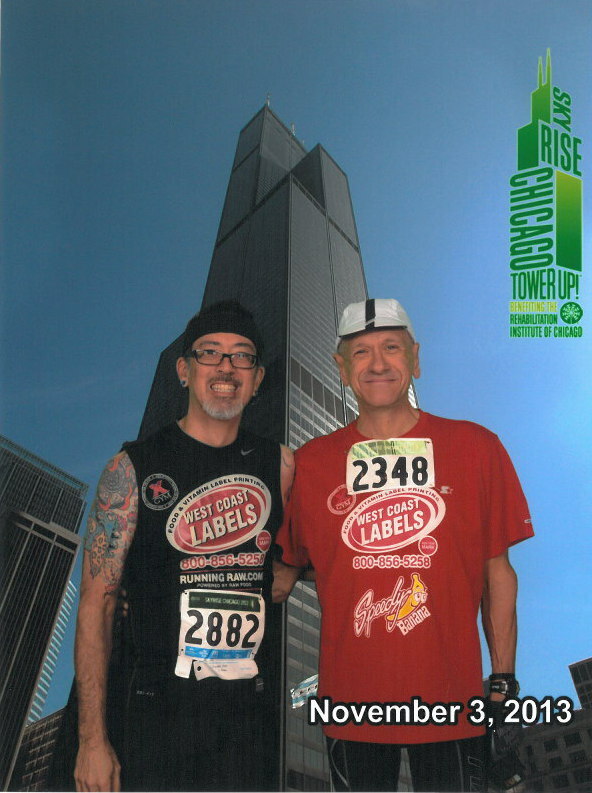 Today was the day for our trip out to Chicago for the Sears Willis Tower stair climb. We headed down to LAX, arriving at the parking lot at about 9:30. As we were arriving there, was heard some sirens and saw a couple of fire trucks headed into the airport. We didn’t think too much about this, since that’s not more than what we’d see if there was a car accident of something like that. 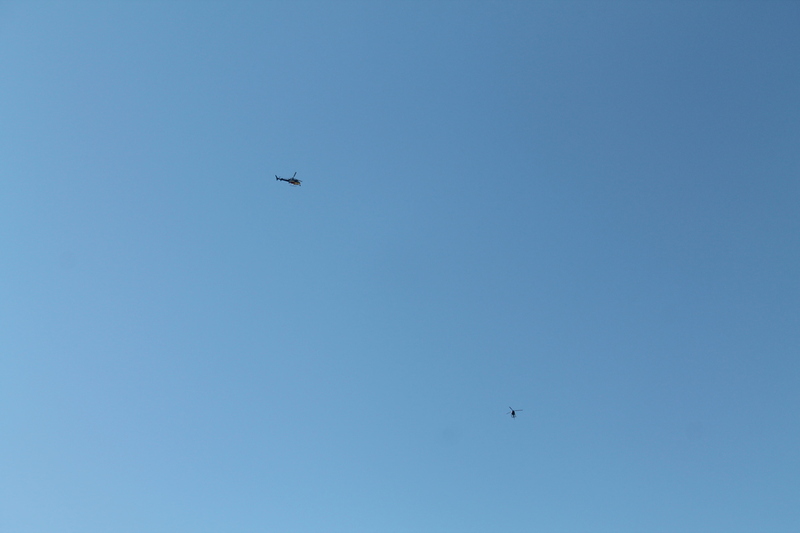 But then we noticed five or so news helicopters hovering stationary over the airport terminal area. Hovering news helicopters are the buzzards of the modern world. Seeing them is never a good sign. When the shuttle bus arrived, the driver told us she had orders not to bring anyone in to the airport, and that they were closing down all operations there for an indefinite time. We waited around for an hour or so to see if the situation would be resolved, but it quickly became clear that it was going to be a long time. So I called United, and they transferred us to the same flight on Saturday, and we went home. Fortunately, since we were out in the long-term parking lot, we were able to leave, unlike the people who were locked down in the terminals. So we went home. 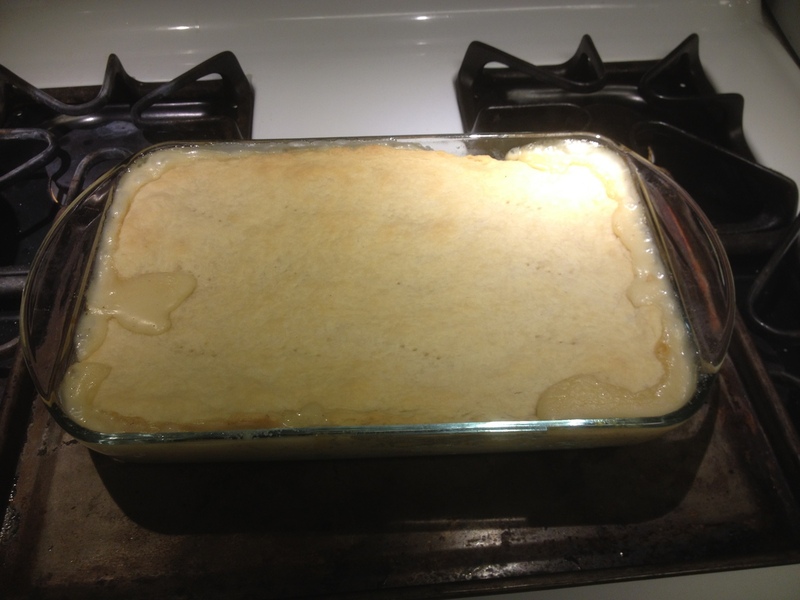 I made a turkey pot pie for dinner, and we went to a movie. And that was that. 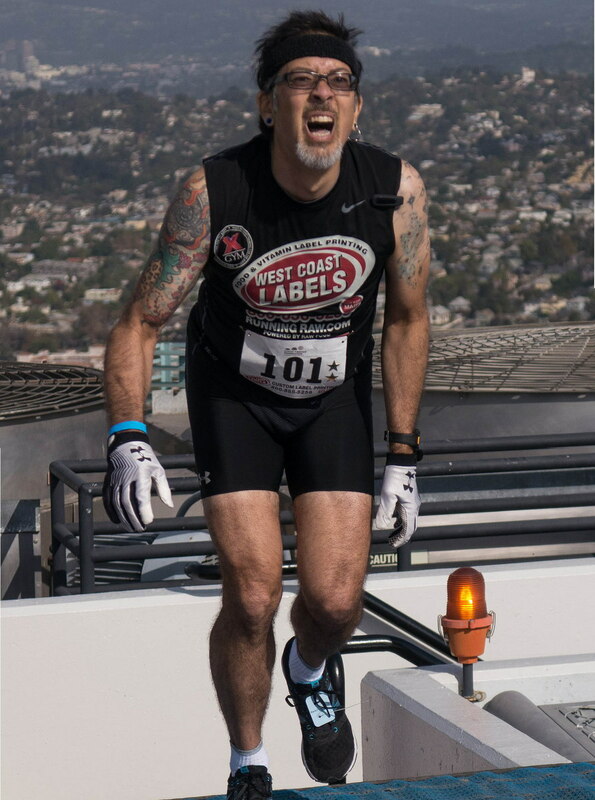 I’m still attempting to make 100 climbs up the Wilshire-Figueroa building stairs by the end of the last race on November 16th. So tonight was yet another practice, and I was there with the goal of climbing the building five times. The first three times went fine. I was able to maintain my ‘modest but slightly brisk’ pace all three, and I got back to the start with plenty of time for the fourth. But on the fourth time up, I just hit the proverbial Wall. 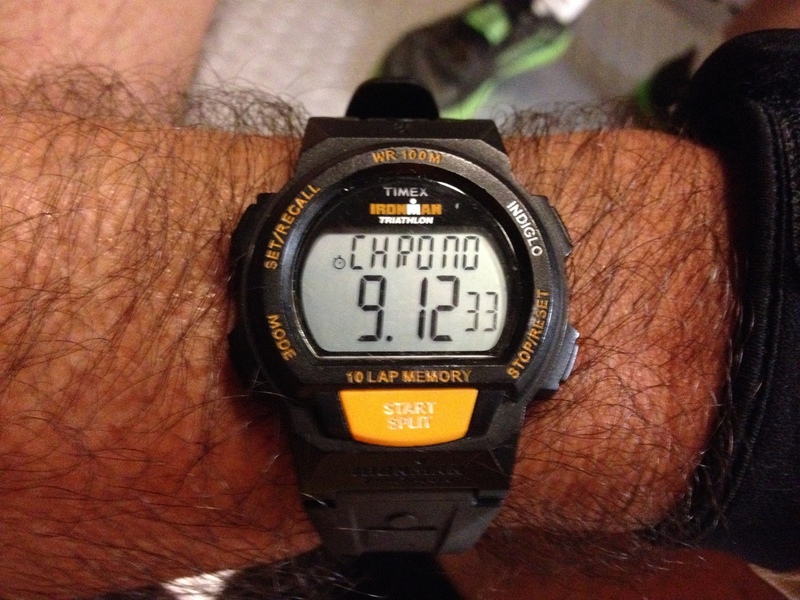 I didn’t feel good at all, and my pace slowed to a crawl. I managed to make it to the top, but I was pretty wiped out. 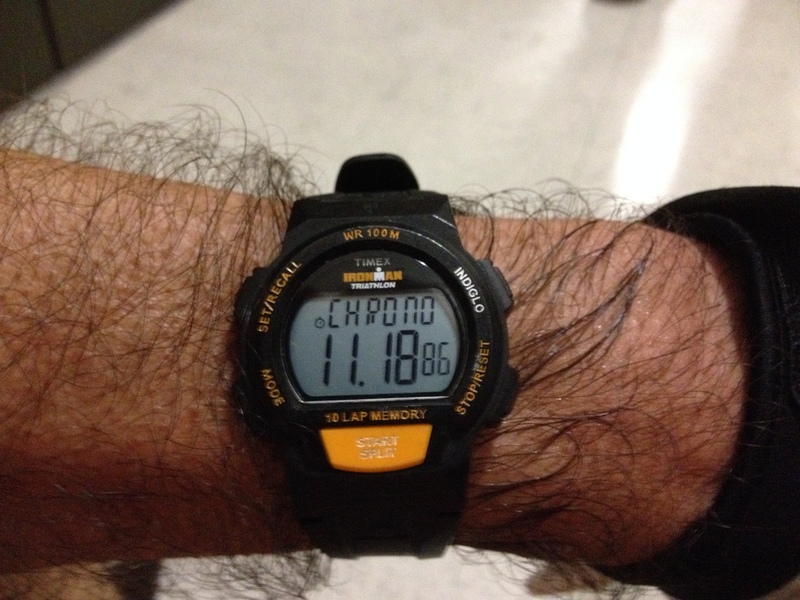 Still, as luck would have it, I got back to the bottom at 6:43, so I was still ahead of the door closing at 6:45. So I thought I’d try one more time. And it was grim. 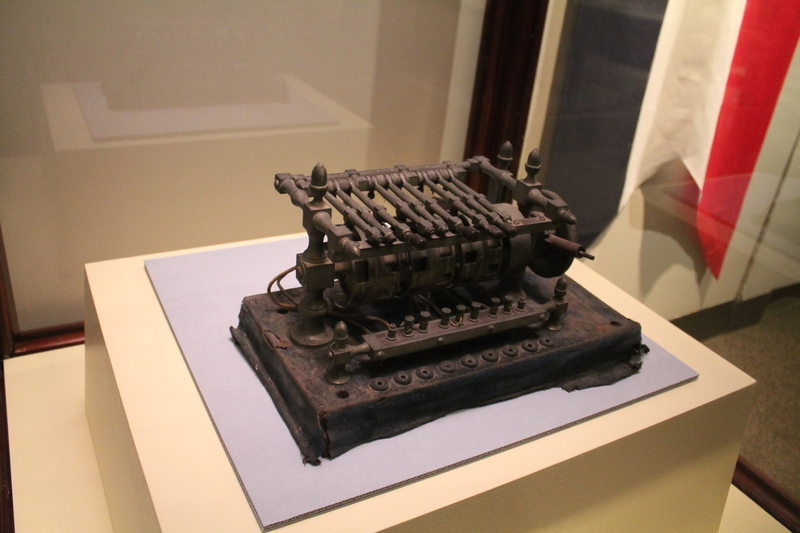 It was a slog, and a struggle for survival all the way up. Still, I made it. I have now climbed the building 92 times. There is one more practice that I can come to next Wednesday. If I can do five that night, then if I do the race, plus two extra on the 16th, I’ll have my 100.